Melt the coconut butter in a saucepan over a low heat. Add the carob powder and stir it in. If it’s too dry add a dash of sunflower oil or more coconut butter. If it’s not ‘chocolatey’ enough add more carob. Add the lecithin (plus the the vanilla bean mark) and a few drops of vanilla stevia (taste it, careful – it quickly gets too sweet). The mixture should have a thick spreadable consistency. Line a small rectangular baking tray with parchment paper and spread the mixture onto the paper as thin or thick you’d like your chocolate to be. Let it cool down on the side for at least ten minutes or longer, then sprinkle on some topping of your choice (I used Goji berries, bee pollen and flaked almond). Lightly press it into the mixture, cover the whole tray with clingfilm and put it in the fridge for twenty minutes or so (it will still be a little soft). Keeps chilled for a few weeks. 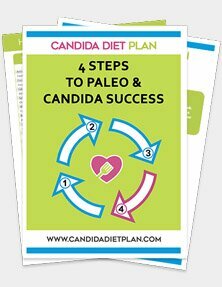 Can you have Goji Berries on the Candida Diet? As far as fruit goes these berries are fairly low on sugar and even healthier than blueberries. But since they naturally still contain a little bit of sugar I would leave the berries out if you are still suffering from Candida symptoms. Carob chocolate on it’s own can taste quite nice too though, so don’t be disheartened if your treats don’t have all the bells and whistles straight away – it will be worth the wait! Because its super high in BVitamins — great for your nerves but also naturally rich in sugar – even more so than the Goji berries and therefore best left until you are Candida symptom free. When can you have brown rice syrup? Towards the tail end of your Candida diet journey you’ll be able to use this fine sweetener for your desserts and treats – I love the caramel flavour, mmmh… but of course this is not suitable during the 3 Candida diet stages, only afterwards when you are transitioning to a more varied diet but are still trying to avoid refined sugar. Until then just use the Stevia drops, that’s still very nice! Question… what’s a vanilla bean mark?